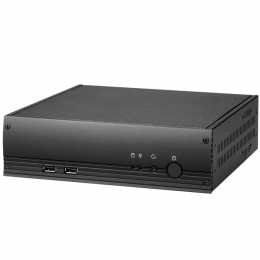 The Booksize 9500 is a well-equipped compact PC in an elegant design. Despite its extremely small size, the 9500 benefits from enormous hardware performance. The convincing system features an Intel Atom single core processor running at 1.8 GHz, a standard memory of 1 GB RAM and 160 GB of hard drive space. This robust 6.4 cm 2.5 notebook HDD is designed for mobile use and easily withstands harsh production environments. The Glancetron 9500 offers high performance as standard and is well-suited for most applications. In order to remain flexible and meet future requirements, the Booksize can be equipped with a memory of up to 4 GB DDR3. You can thus execute particularly demanding applications where little space is available. The integrated 160 GB SATA hard disk drive provides sufficient space for system and data. The particularly fail-safe Glancetron 9500 is ideal for 24/7 operation or use in harsh environments such as in hospitality, discotheques, etc. The Intel processor produces much less heat and requires less ventilation, which in turn greatly reduces energy consumption and costs. The CPUs passive cooling technology and the sleeve-bearing case fan ensure that the PC functions almost noiselessly. Thanks to its maximum noise level of 21 dB, the PC can be placed into the customer area or mounted into larger installations without being disturbing. Highest performance and small dimensions predestine it for diverse applications. The compact PC even fits into confined spaces. Using the optional wall-mount bracket, you fix it to a table or wall with the elegant stand included in delivery, you can also position it vertically and save even more surface space. Its compact design allows the PC to be mounted to the rear of terminals and monitors and thus to combine them in a complete high-performance system. The appropriate VESA-mount option is available separately. Its large range of interfaces make the 9500 suitable for professional use beyond that of the POS next to standard ports for VGA, keyboard, mouse, printer and audio in/out etc., a parallel and four rear USB ports provide a variety of connection options. Optimum flexibility in daily business is assured by two additional front USB ports. A 10/100 Ethernet interface also guarantees easy integration into existing infrastructures. All these features make the 9500 the ideal platform to respond to challenging demands in terms of performance and space for use at the POS, POI, and back office, infotainment, multimedia, laboratory and as a workstation. A number of special accessories such as compact keyboards and mice are also available. If you wish, we will pre-install the operating system choose from Windows 7, XP or POS Ready this service will save you a lot of time - you simply unpack, set up and start The external power supply unit is of course included in the scope of delivery.